Dear friends of brass music! 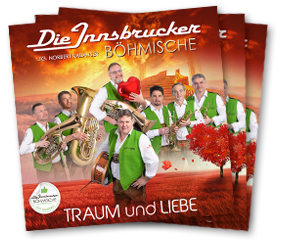 We have passed 20 years now, being on the move as"Innsbrucker Böhmische" and we've always tried to cultivate the most possible perfection of brass music passionately and with all our enthusiasm. It's been great success for us, that we managed to win the hearts so many music enthusiasts and they are getting more and more. Unforgetable concerts on big or small events within Austria but also abroad, invitations to the biggest "Böhmische Musikfestivals" all over Europe, one golden CD-Production and many concerts on radio and TV are the proof that it was worth to go our own way within the bohemian brass music at the time and create a totally new and unconventional 7 man ensemble with a very special and uncomparable sound. The history of the "Innsbrucker Böhmische" started at the "Tirlerwirt" on the Seiseralm in South Tyrol during a very rustic evening in an alpine hut. Farmers, the innkeepers and a few tourists and some musicians were present - not many but it was a lot - it was just right: the "Innsbrucker Böhmische" was founded. First the musicians played in the well known "Oberkrainer" formation: Norbert Rabanser - drums, composer and head of the team, the trumpets Heinz Weichselberger and Rupert Darnhofer, accordion Fredl Gradwohl. 3 CDs came out of that formation called "die Innsbrucker", which were welcomed with big attention and enthusiasm, and are still highly rated amongst experts and insiders. Gradually the wish of enlarging the ensemble to the typical "Innsbrucker Böhmische" developed and now there are 6 brass musicians and one drummer. At present beside Norbert, Heinz and Rupert the trumpet player Markus Ettlinger, the trombone players Harald Kobler and Mathias Rauch, the tuba player Gerhard Anker are part of the ensemble. This formation, also criticized in the beginning, has established in the bohemian brass music scene and found enthusiastic fans and many imitators. A trademark of the group are the own compositions and arrangements from Norbert Rabanser and Mathias Rauch, which require high virtuosity on the instrument. This is guaranteed, because of our highly valued and excellent musicians , who all have graduated from a university study and have played in famous orchestras and formations like the Vienna or Munich Philharmonic Orchestra, the Orchestra of NDR, the "Gewandhausorchester Leipzig" or the Tyrolean Symphony Orchestra Innsbruck. Furthermore we are tutors at different music schools, at the Tyrolean academy of music and at the "Mozarteum" in Salzburg. We are very thankful for the appreciation from our fans, the remarkable friendship, that developed in the last years and we are looking forward to reviving the bohemian brass music with your support again and again.